Below we answer three common questions on corn nitrogen demands and discuss ways to make the most efficient sidedress application. When does a corn crop need most of its nitrogen? Growers often want to put nitrogen out early in the season—when it is easier to apply—to get their corn crop “up and going.” However, actual peak nitrogen demand for corn is right before tassel (V10 – V14), continuing on through grain fill. Making a sidedress nitrogen application can be an effective way of making sure the crop has the nitrogen it needs when demand is greatest. How do I know if I am supplying enough nitrogen to meet peak demand and to carry through to grain fill? Generally 1 to 1.1 lbs of nitrogen per bushel of corn is a good rule for estimating total crop need for the season. However, the nitrogen still has to be taken up by the plant to deliver yield. Nitrogen lost through volatility, denitrification and leaching is no longer available for plant uptake. 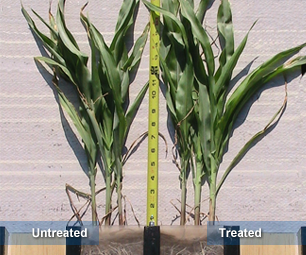 In addition, poorly developed root systems have less opportunity to take up the nitrogen that is available. Using a split nitrogen application—that is, making part of the application at pre-plant and part at sidedress—can deliver nitrogen when the crop needs it most. This can be especially beneficial in wet years where leaching of pre-plant nitrogen is likely to have occurred. How can I ensure that the nitrogen I applied is available and taken up by my crop when it needs it? Many growers prefer a program that both protects the nitrogen and ensures efficient uptake and utilization. To get the most out of applied nitrogen, growers can use a nitrogen stabilizer to help protect nitrogen from denitrification and leaching, combined with a biocatalyst technology like Accomplish® LM to help increase root growth and nutrient availability. Learn more by viewing our sidedressing infographic or watching our "Sidedressing Nitrogen for Maximum Yields" webinar. Accomplish is a registered trademark of Loveland Products, Inc.